The Global Land Tool Network (GLTN) is dynamic and multisectoral alliance of international partners committed to increasing access to land and tenure security for all, with a particular focus on the poor, women and youth. The Network’s partners include international rural and urban civil society organizations, research and training institutions, bilateral and multilateral organizations, and international professional bodies. We develop, disseminate and implement pro-poor and gender-responsive Land Tools. These tools and approaches contribute to land reform, good land governance, inclusive land administration, sustainable land management, and functional land sector coordination. Secure land tenure and property rights are fundamental to accessing adequate housing, food security and livelihoods. Land tenure security is crucial for the realization of human rights, poverty reduction, economic prosperity and sustainable development leading to the attainment of the Sustainable Development Goals, the New Urban Agenda and other regional and country level policy initiatives. A Land Tool is a practical way to solve a problem in land administration and management. It is a method of putting principles, policies and legislation into effect. Our Land Tools and Approaches generate change through the new ideas and changing mind-sets. They explore new ways of organizing systems, are an entry point into the land sector, and trigger catalytic change. Approaches to land and tenure security must take into consideration the complexities of people’s customs and culture, gender, life stage course, administrative, and development contexts. We advocate for land tenure that best suits the social, cultural and economic needs of local communities along with the needs of responsible land administration authorities. Partnership and collaboration: We believe in the power of collaboration and value partnerships and collaboration as a fundamental way of undertaking our work. The collective inputs of different stakeholders and institutions engender change and develop inclusionary approaches. When all key voices and perspectives are heard, these approaches generate innovative solutions that sustainably deliver change for those who most need it. 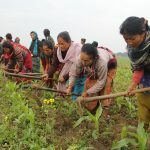 Sustainable worldwide change in the way land is managed in countries and communities cannot be achieved by individual organizations, no matter how powerful and well-funded. Access to land and tenure security for all, including the poor and women, requires the aligned and well-coordinated action of all land actors. 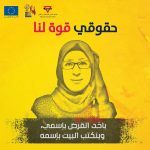 Our Network of the civil society, professional institutions, research and training organizations, bilateral and multilateral agencies, governments and the private sector address this requirement. Click here for more information on the organizations that are part of GLTN. 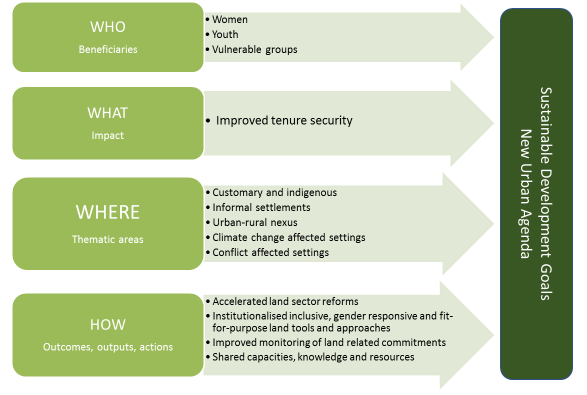 A flexible and inclusive view of land tenure based on the Continuum of Land Rights. A range of innovative land tools designed in line with proven standards and good practice, including fit-for-purpose land administration. A focus on pro-poor, gender- and youth-responsive approaches. A recognition of the interconnections between urban, peri-urban and rural land. A dynamic international partnership involving key land actors and stakeholders. The ability to undertake concerted multi-disciplinary, multi-level, cross-sectoral and inclusive initiatives at local, national and international levels, as tailor-made and sustainable responses to specific land access and tenure security challenges. 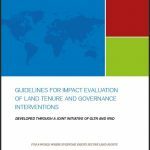 Innovative, affordable and adaptable land tools to support and complement (or, where necessary, replace) existing land administration systems to deliver land tenure security in urban, peri-urban and rural contexts. These tools also serve as a means of implementation for the fulfilment of states’ obligations under relevant treaties, general principles and norms in international human rights law. Flexible methodologies and capacity development programmes at all levels that combine and bridge the political, social, human and technical dimensions that are essential for responsible land administration. Well-tested, in-country modus operandi which involve and empower local and national actors such as grassroots groups, communities, civil society, governments, the private sector, relevant professions, local and national governments and the United Nations to use land tools for tenure security. 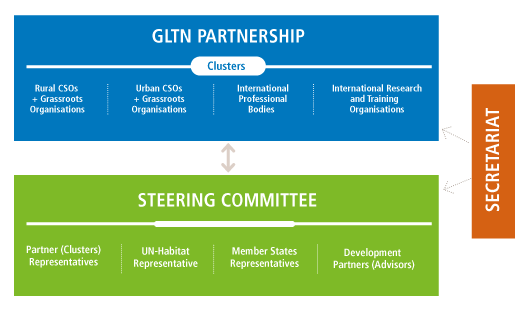 Through GLTN’s alignment with the UN system through UN-Habitat, use the convening power and mandates of the United Nations system). Advocating for improved tenure security for all towards fostering understanding and building capacity on the land monitoring agenda. 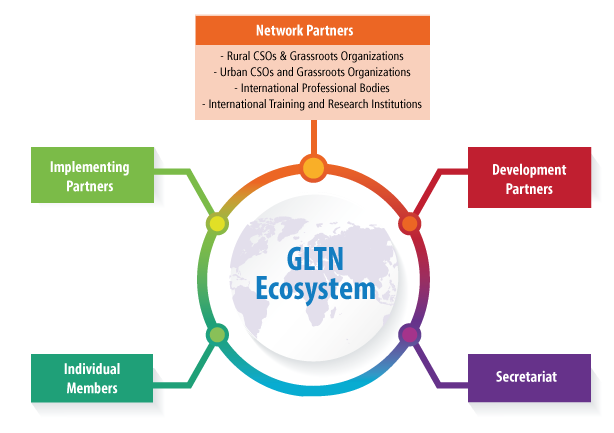 GLTN Partners represent diverse sector groups, share in the core values of the Network and contribute to the achievement of the GLTN agenda and objectives. 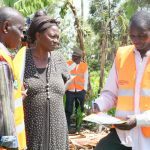 The Network sits within a broader land ecosystem that includes individual members, implementing partners, the GLTN Secretariat as well as development partners. International Urban Civil Society Organizations. Click here for more information on GLTN partners. The GLTN Secretariat is hosted by UN-Habitat and it is based in the Land and GLTN Unit at the UN-Habitat headquarters in Nairobi, Kenya. The Secretariat is responsible for the day-to-day operations of the programme and over-all Network coordination. The Individual Members of GLTN are those individuals who registered on the GLTN website and join GLTN to be affiliated with the Network and receive GLTN updates and information, join e-forums and web discussions when available, access e-libraries and participate in the open section of the bi-enniel GLTN Partners Meeting. Click here to become a GLTN member! 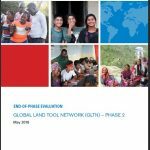 As part of ensuring a vibrant and effective Network, the organizational arrangements of the Global Land Tool Network were reviewed in 2018 and a new set of arrangements developed in response to partners feedback. The Network now has an inclusive Steering Committee comprising partners represented by the dual leaders of the 4 main clusters, development partners, and supported by the GLTN Secretariat. The Steering Committee is Chaired by the Deputy Executive Director of UN-Habitat, Mr Victor Kisob and the Vice-Chair is Ms Mino Ramaroson of the Huairou Commission. Two individuals representatives from different organizations within each of the clusters groups are nominated as the Partner Representatives to the GLTN Steering Committee. These representatives are also the cluster co-leads. The Urban International Civil Society Organizations Cluster: Jane Katz, Habitat for Humanity International and Ms Sarah Nandudu, Slum Dwellers International. The International Professional Bodies Cluster: Diane Dumashie from the International Federation of Surveyors (FIG) and Rafic Khouri, Arab Union of Surveyors. GLTN programme has so far had two cycles: Phase 1 (2006–2011) and Phase 2 (2012–2018). 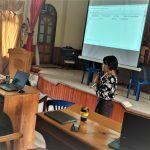 GLTN Phase 3 programme (2019-2023) was developed with a conscious application of the gender lens for a human rights-based approach to programming. 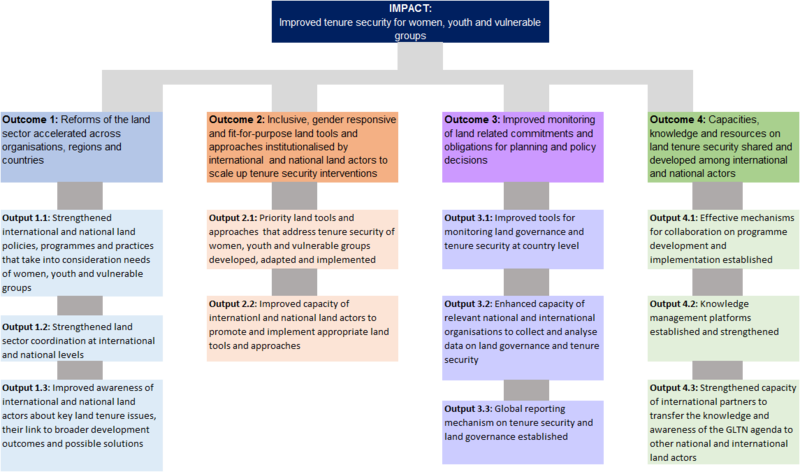 A key new feature of Phase 3 is a decisive move away from simply demonstrating the local impact to more institutionalized and strategic scale-up of the GLTN land toolbox for country-wide implementation. Phase 3 will therefore involve empowering, sharing knowledge and building partners’ and governments’ capacity to appropriately implement our land tools, and to fill the technical solutions gap. The programme is jointly implemented by GLTN partners and the Secretariat. The Secretariat, hosted by UN-Habitat in the Land and GLTN Unit of the Urban Legislation, Land and Governance Branch, will facilitate the administrative and financial aspects of the programme.